Amazing Bigfoot Trackway in Minnesota! This is a 3-mile trackway that was found in Minnesota along the Canadian border. This area of the state is heavily forested and has very little human activity. 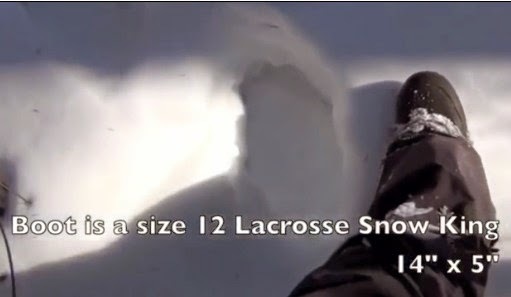 The men who discovered the tracks were out snowmobiling in March of 2012 when they noticed large footprints in the snow and decided to stop and take a look..
As far as evidence goes, I think this is very compelling. The subject that made these tracks had to go through some very deep snow walking with an in-line step. The strides are very far apart and you can actually see what appear to be toe impressions in the snow. It would be very hard to hoax these tracks. The filmer says "I don't know if anybody has ever seen anything like this." I've always thought this video is very compelling.